After a week of nasty weather, 3 snow days from school, lots of shoveling with over 4 feet of snow....what do I say? Spring is coming, my friends are boiling maple sap right now to make syrup. 36 gallons of sap to make one gallon of syrup. The snow is slowly melting (TG), I've seen robins in the yard for weeks, saw my first vulture returning this past weekend and I even heard a red-winged blackbird this a.m. while doing chores. I am excited about changing the clocks this weekend, spring is in the air. Things have been slow at NY Wildlife Rescue Center lately but will pick up shortly as "orphan season" begins. January was everything that I thought it would be. I kept busy doing little projects and showing many interns from SUNY Cobleskill's Wildlife Program what we do here. February was unproductive. My wife and kids went with their grandparents, aunt, uncle and cousins to Disney World in Orlando. I stayed home to try to get some wood cut and hold down the fort. The weather was lousy, I wish I had gone with them now. The highlight of my winter break from school was going to General Electric (with Gayle and Kelly) to do a program for their Wildlife Committee. The Whitney Club have supported us with checks and volunteer labor for years, they are good friends and we love doing our programs for them. The ride home during the blizzard was interesting but we made it, my truck really needs new tires. March is a great month, spring is in the air. I did a Wildlife Program for the West Fulton Rod and Gun Club last week. I love speaking to hunting clubs, we have the same mission. I am all about conservation and preservation of wildlife. A good Rod and Gun Club will have the same mission statement. It was a good program and I believe that when it comes time to build the Raptor Flight their members will be there to help us. I appreciate their donation also. This past Saturday, I did a Wildlife Program for the Golden Age Club of Middleburgh. I had a lot of fun and their lunch was great. I am surprised at how many people in the town where I grew up, live and teach don't know what we do up on the hill. I've made it my mission this spring (before things get busy again with orphaned wildlife) to get the word out locally about what we do. I will gladly speak and bring some of our licensed educational animals to any group that would like a program. I just try to keep my programs within a reasonable driving distance. Last night I received a phone call from Cornell University's Wildlife Center. I expected that it was a call to see how Oscar the Bobcat was doing. Oscar is healing up nice but still favors the one hind leg a bit. I am still hoping that he is releasable. If he isn't, I would love to find a zoo with a native wildlife section that has a great enclosure for him but that is not a decision for today. The vet that called explained that Dr. Randell of Somers Animal Hospital has been working on another male bobcat that was hit by a car in Croton Falls NY, Westchester County. Deja Vu. I think that I've done this before. Cornell was wondering if I could help house and continue rehab on this Bobcat. The Wildlife Hospital at Cornell University offered to provide support care. I quickly agreed. Somers Animal Hospital did a great job on this cat. 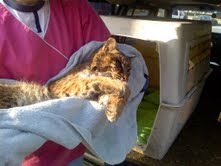 Check out their website, www.somersanimalhospital.com and be sure to drop them an email thanking them for what they did to stabilize the bobcat. Many vet clinics do not want to deal with wildlife, this vet clinic went above and beyond. I am impressed: check out the bear surgery photos on their site...awesome. I agreed to help and said that I would start to figure out transportation to our facility. I instantly emailed Kim and Karen, two wildlife rehabbers that I greatly respect in the Rhinebeck area to ask if they would help with this cat. Kim and Karen were the wildlife rehabbers that caught and brought Oscar to me last year. They agreed to pick the cat up at Somers Animal Hospital and meet Roger to transport the rest of the way up to me. Roger is a new wildlife rehabilitator. He is also the man that saw Oscar laying along the road last year and stopped to see if he could be saved. He took such an interest in Oscars recovery that he visited, sent checks and took his test to become a rehabber himself this past fall at the Wildlife Rehabilitators Conference in Lake George. Roger agreed to meet Karen, transfer this cat into his car and drive another hour to meet me at a convenience store by the Rip Van Winkle Bridge. We did that last night. I really appreciate the help from Kim, Karen and Roger. I appreciate that Kayla, one of our High School volunteers, came along with me for the ride. No one can do Wildlife Rehabilitation without a network of friends and help. They know that I would transport the other direction towards them if needed. It is easier to have 3 people drive an hour each way than force one person to make a 6 hour round trip. I still need to get a transportation chain linked between our facility to Cornell. I know that if we could shuttle raptors and wildlife easier between the Wildlife Health Center at Cornell and NY Wildlife Rescue Center that they could fix and I could rehabilitate many more animals that really don't have a place to go to heal for several months. This new Bobcat, that I've been calling "Deja Vu" (I don't name wildlife), was pretty out of it last night. He has head trauma, a dislocated leg, and nerve damage in another leg. I don't think that Deja Vu is as messed up as Oscar was with his fractures. I got the bobcat settled in last night when we got home, he hasn't eaten in two days since the accident. Bobcats don't like commercial cat food if given a choice. I feed all of our bobcats the same defrosted dead rats that I feed the raptors. I gave him a couple last night and I didn't see the rats this morning but it was kind of hard to tell if they were in his cage or stomach with him attacking the sides of the cage. Tonight we will try some defrosted mice....yum. I like mice, they are easy to sneak his meds into. 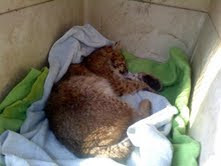 I am excited to have the honor to save another Bobcat. I know that it is going to be expensive and time consuming but I like a challenge. I needed something to keep me busy until Orphan Season starts in another month. Now since I have something to write about, I will try to get blogging again. I will also try to get a photo of "Deja Vu" up on the blog asap, Roger took a couple last night. This bobcat is bigger than Oscar. Oscar was 17 pounds the day he was hit by a car, this bobcat is almost 24 pounds. I will also try to find out the details of the accident. Be back soon, Thanks for your continued support. PS: thanks to Karen LeCain for donating the pictures of "Deja Vu". Have your photo taken with a live bunny or lamb! Sunday March 21th 10a.m. to 2p.m. To help raise funds and awareness for the New York Wildlife Rescue Center, a local non-profit animal rescue located right here in Middleburgh. ***Please join us for a day of fun and have your photo taken with a bunny or lamb and learn something new about our local wildlife. Live Birds of Prey will also be on location for viewing and question/answer sessions. The New York Wildlife Rescue Center is a registered non profit that relies on private funding to support all of its releasable and non-releasable wildlife.